You can see the twists in the cable if you look in the top-left of the above photo and if you take a look at the bottom you can see the internal wires are beginning to show so this is too dangerous to even attempt to use. As it only cost me £5 plus £8 delivery (and it was very well packaged) it's not the end of the world to buy a replacement adapter. It was advertised as faulty/damaged so I just ordered it for spares/repairs should I (hopefully) get a working one in the future. What are those I hear you cry?! Well they are called Instruction Manuals - like a physical copy of a PDF you end up nowadays! No idea what the spec of this little beauty is as it was not on the eBay listing, I know the Evo is a Retro range of Compaq Laptops so was happy to pay just £22.95 (including delivery) for this laptop and power supply. It was being sold by a charity on eBay so wasnt fussed at not knowing what the spec is it will either be a Pentium II or Pentium III (I think)! It does power on and has Windows XP on it but the serial number on the bottom and the sticker on the wrist-wrest is for Windows 2000 Professional so at some point I will put 2000 back on it as it was the original operating system for this laptop. I've not had a chance to try it out yet so no idea if it works or not but the seller I purchased it off said it had been tested and found to be working OK.
Intel PMD30005002AA Mobile Pentium II 300MHz MMC-1 CPU Board. I've not been collecting for long but I already have amassed quite a few laptops so I've decided to get my finger out and catalogue, grade and photograph them in their current state. If you click on any of the links/pages you will see the specification of the laptop in question, what (if anything) is wrong with it and some photographs of its current condition. Once I have finished documenting all my laptops I can then start to get as many as possible re-graded to the Grade A category by servicing and repairing any faults and getting a relevant OS installed on them. I'm using the Snipe-IT asset management system to catalogue my collection as it's Open Source, quick to install (if you use the automated script) and very easy to use! You can add stock photos of a laptop so when you add a new asset that is already in the system there will be a photograph already associated with it, if you want you can even add a specific photo to each asset so you can see exactly what it looks like (including any damage/issues etc). It's a Linux based system (of which I am no expert on) but I have installed CentOS 7 before so I have used that on a Windows 10 Hyper-V Virtual Machine and it works like a dream! Turns out I must be a natural hacker as the first 'password' I tried no only let me in but it was also the local Administrator password when Windows 2000 finished loading! Oh and the bonus was a 'free' Madonna CD that was left in the drive, it didn't play the first time I tried. 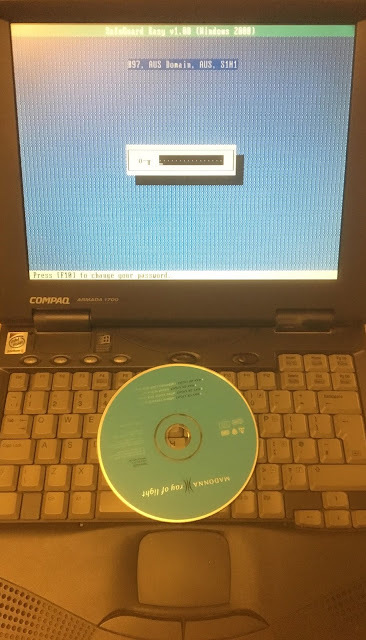 The laptop is covered in dirt and dust so I ejected the CD-ROM and gently cleaned the lens with a cotton bud, tried again and it worked like a dream! Are you getting the 162 System Options Not Set on an old vintage/retro laptop? Is it followed by a message telling you the Time and Date are not set? Does it go on to ask you to save the changed or ignore them? The biggest clue to what is causing this error message is the date/time not being set. When you power off your laptop a small button battery keeps the on-board real-time-clock (RTC) and it is this that keeps the time and date on your laptop correct and on some laptops it also keeps any System Setup or BIOS/CMOS settings stored too. Luckily there is an easy fix, replace the RTC/CMOS battery! Click here to see how to replace the RTC/CMOS battery on a Compaq Armada 1700/1750 - including how to make your own. 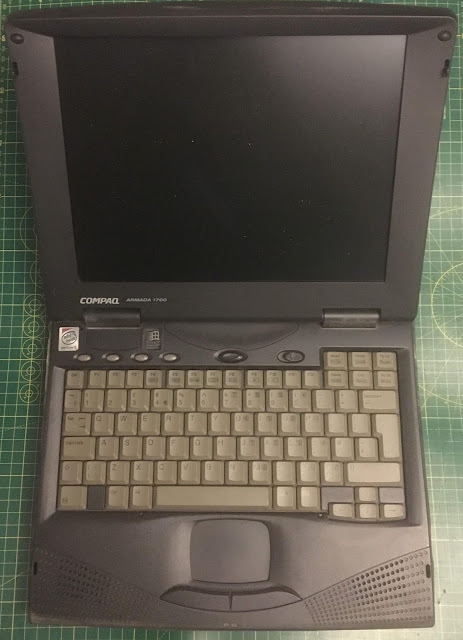 On a Compaq Armada 1700/1750, once you have replaced the battery you will need to then load up the Computer Setup program either via a floppy disk (or if you have it installed on the maintenance partition of your hard disk drive you can press F10 shortly after the POST). I have it on floppy disk so I inserted it in to the floppy disk drive and launched the setup program that way. Once in the Setup Program have a look around and make any changes you like and then set the date and time. Save the settings, exit and then reboot! I took the opportunity to set the Asset Tag of my laptop and also the Company and now when I power on my laptop it shows the company name (I used the URL of this blog as the company name)! As you can see in the next photo, I've put in all my tools from my soldering iron to torx screwdrivers and it's already chock-a-block! What do I need all those (very) old Compact Flash cards for, they're in MB and not GB?! For use with this of course! Compact Flash cards are basically IDE so you don't need a fancy adapter with a microchip in it doing some jiggery-pokery, it's simply connects the appropriate pin on the adapter to the correct output on the IDE connector so they are ideal for use on Retro/Vintage laptops. As 486 laptops tended to have hard disk drives of just a few MegaBytes (MB) then I've had to snap up as many low capacity Compact Flash cards as I could - all from my current favourite place, CeX where (including postage) I didn't pay more than £2.50 per card. It's been a busy day for the Postman today as I've had yet another delivery! This time it is a PCMCIA Ethernet card that works with Windows 95, 98, 2000 and XP - ideal for those laptops that don't have an Ethernet port so I can easily transfer files across to the laptops that I have. Who remembers when games used to come in big boxes like this?